Are you ready to experience the San Juan? This grand home was built to be an oasis, an escape from the ordinary and you can see that from the moment you step onto the property! 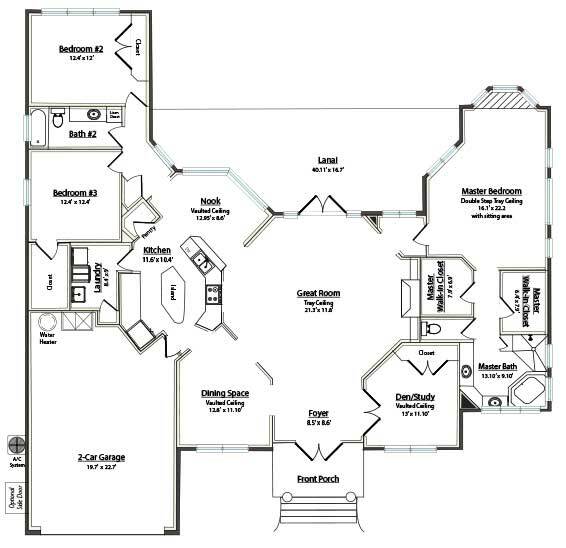 The San Juan is part of the Custom Home Oak Ridge portfolio, meaning every detail to this floor plan can be customized to fit your needs or built like we have it; that is the beauty of building a custom home with Oak Ridge Homes. The stone adorned archway is the first thing you will see upon arrival as you walk up the beautiful pathway to the grand entrance of the San Juan. Once you enter the home you are sure to note the light, bright, open layout looking straight out to your private backyard and extra large lanai. The lanai spans the entire back of this home, making it roomy enough for an outdoor kitchen and entertaining space you will not want to leave. It is like having another room and the natural light the windows provide is absolutely stunning! To the left of the great room is the large Chef’s Kitchen with a nook that you can use as an extra workspace or eat-in area for smaller family meals. To the front of the kitchen is the formal dining room with vaulted ceilings to add to the grandeur. You will be sure to have fun entertaining in this space. Across the foyer is the den/study or fourth bedroom. This space can easily be used as a second living space, guest retreat or a home office. In the west wing of the home, you will find a luxurious master suite with elegant finishes, from tray ceilings to a window seat. The bedroom also features his and hers master walk-in closets and just beyond the expansive closets is the en-suite bathroom. The bathroom features his and hers vanities, oversized walk-in shower and beautiful garden tub. Treat this space as your private escape away from the world and the rest of the house. From your suite you have access to the large lanai, truly a paradise in your own home! The east wing of the house, behind the kitchen is where you can find the other two bedrooms and second bathroom. Great for guests, as this wing offer privacy away from the rest of the home, the third bedroom even has it’s own walk-in closet! The indoor laundry is well situated in near the kitchen, second and third bedrooms. It is large enough to store all your cleaning items in the convenient linen closet and offers a built-in wash basin to make cleaning that much simpler. 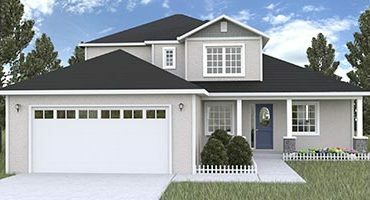 The 2-car garage is oversized, providing that extra space you may need for storage or a workspace, possibly that man cave he has always wanted, the possibilities are endless with this model, as with all of our custom homes. Each is designed with you in mind!